Rich and Linda Horner joined Rep. Donna Oberlander in the state Capitol on March 31, when the House voted unanimously to pass House Resolution 118 naming April 2015 as Esophageal Cancer Awareness and Prevention Month. Rich is a seven-year survivor of the disease and both have been instrumental in raising awareness. 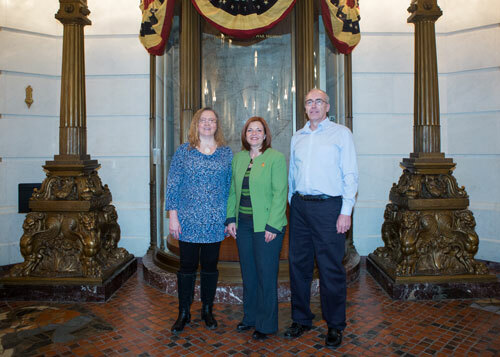 HARRISBURG – In an effort to bring greater attention to esophageal cancer and raise awareness about early detection, Rep. Donna Oberlander (R-Clarion/Armstrong/Forest) has secured House passage of legislation designating April 2015 as “Esophageal Cancer Awareness and Prevention Month” in Pennsylvania. During Tuesday’s House session, Oberlander recognized Rich and Linda Horner of Rimersburg for their ongoing efforts to raise awareness of this disease. This year, Rich celebrates seven years since his diagnosis, and they both joined Oberlander on the House floor for a vote on the resolution. According to House Resolution 118, one of the most common causes of esophageal cancer is heartburn or gastroesophageal reflux disease, which is viewed by many sufferers as an acceptable condition of life. That condition, however, can lead to Barrett’s esophagus, which results in as much as a 125 percent increase in a person’s chance of developing esophageal cancer. To view Oberlander’s video comments from Tuesday’s House session, click here. Medical experts note that with monitoring and treatment of this type of reflux, the potential for long-term irreversible damage leading to esophageal cancer can be avoided. Sadly, esophageal cancer can even occur without reflux symptoms, due to a history of smoking or excessive alcohol use, and federal funding for this type of cancer does not measure up to the levels of other types of cancer.